PORT HUENEME, Calif. - Seabees assigned to Naval Mobile Construction Battalion (NMCB) 4 participated in a Defense Support of Civil Authorities (DSCA) loading exercise (LOADEX) aboard amphibious transport dock USS San Diego (LPD 22) at the Naval Base Ventura County Port Hueneme Harbor, Jan. 26. The DSCA LOADEX was designed to train and familiarize Sailors on rapid response capabilities to support recovery efforts and assist local authorities following man-made and natural disasters, such as industrial accidents, hurricanes, and earthquakes. 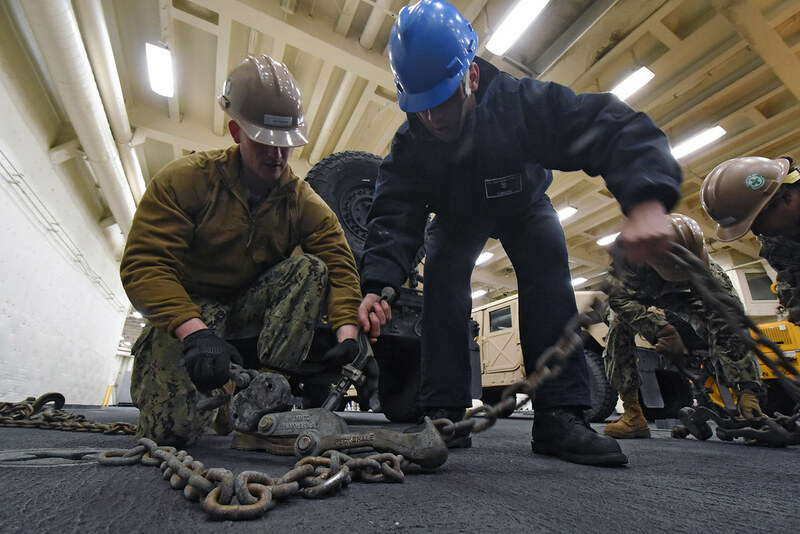 "This exercise was important because it allowed the Seabees and San Diego Sailors to become familiar with each unit's capabilities and limitations in regards to loading and storing equipment," said NMCB 4 Embark Officer, Lt. j.g. William Hennings. "The success of this exercise will allow us to provide valuable lessons learned to help improve DSCA plans in the southwest region." Before the exercise began, San Diego Sailors simulated training for the Seabees on the correct operating procedures for securing a landing craft utility (LCU), including line handling, mooring, and off-loading equipment from the LCU. "We also conducted training on-loading support equipment onto the ship, which could be anything from a backhoe to a grader," said Equipment Operator 3rd Class Nathan Gillilan. "Today we loaded eight humvees and properly secured the equipment to the deck using chains and gripes. Since this is the first time we've done this, it was a foreign concept at first. Now that we know what to do, we can take what we learned back to the battalion to train others." The exercise provided an opportunity for experts to train together by practicing loading and unloading operations in a controlled environment. 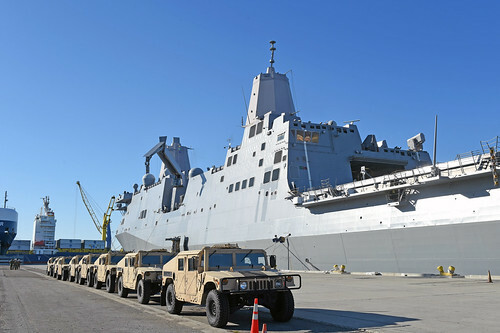 It gave the team a better understanding of how to prepare an amphibious ship for deployment in response to a real-world event. "This type of exercise has not been done before between Naval Construction Group (NCG) 1, U.S. 3rd Fleet (C3F) and Expeditionary Strike Group (ESG) 3 units," said NCG 1 DSCA Plans Officer, Lt. Rodney Inciong. "By conducting the LOADEX in Port Hueneme, NCG 1 can provide information and data that C3F planners can use to improve their DSCA contingency plan. C3F and ESG-3 planners will know how long it will take to prepare our equipment and get it ready to be loaded on the ship." Not only did the Seabees gain knowledge on ship operations, they also gained experience working aboard a ship. "One thing I liked about this exercise was getting the chance to go aboard the ship, because for most of us this was our first time," said Gillilan. "I think our air detachment team worked very well with the ship's crew members, and I can't wait for our next opportunity to do something like this again." NMCB 4 provides general engineering, disaster relief and humanitarian assistance, and civil support to Navy, Marine Corps, and joint operational forces through planned deployments and contingency response.